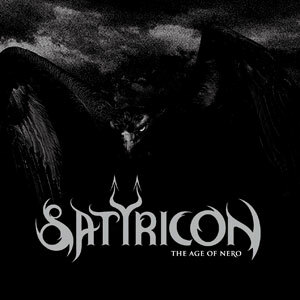 Since around Volcano when they really began straying from their medieval black metal roots and introduced modern elements into their sound Satyricon have managed to both shed and gain fans. The Age Of Nero isn't going to dam that flow. The opening strains of Commando sound like they're morphing into Ministry, the ebbing, dragging riff underscored by Frost's relentless drumming is an obvious continuation from where they left off with Now, Diabolical. The Wolfpack, disappointingly, seems to be almost composed entirely out of bits of the last record's title track. Throughout the pedal has been firmly locked at mid-paced, as the riffs roll out, shouldering boulders and really trying to make themselves noticed, especially during standout song Black Crow On A Tombstone. ˜The Sign Of The Tyrant starts promisingly but ends up coming across all tired and used. Little touches, like the frosty, Edward Scissorhands atmospherics misting in the back of My Skin Is Cold are good, however Satyricon seem too content to stick to the formula they've been using recently. They've managed to create a safe, non-essential album with a few good songs on it, which is either a mid-period stumbling block or the beginning of the end.